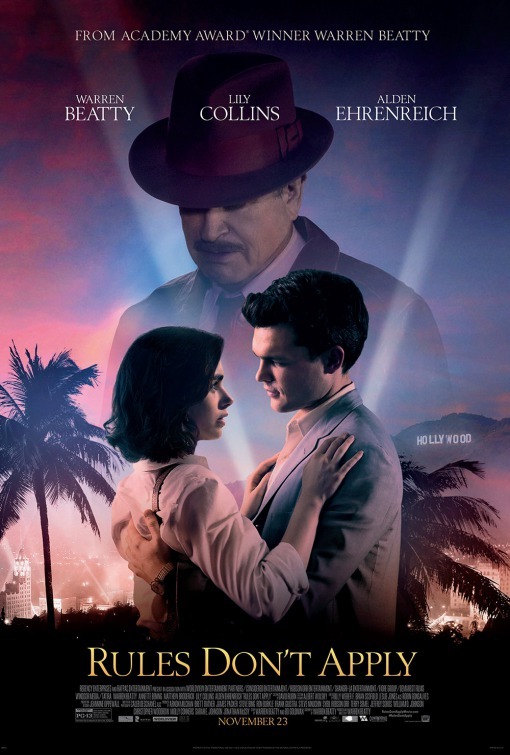 Legendary actor Warren Beatty returns after an almost fifteen year screen absence with his Hollywood film Rules Don’t Apply as he deftly deconstructs the later years of Howard Hughes in Hollywood in the mid-1960’s. If Martin Scorsese’s Oscar winning film The Aviator about reclusive billionaire Howard Hughes is the starting point then Rules Don’t Apply should be the bookmark on an extraordinary man whose legendary eccentricity almost exceeded his insurmountable wealth. Unfortunately despite a handsome production design, Rules Don’t Apply should have garnered more critical acclaim than it got. The Warren Beatty film got released in the midst of Hollywood’s diversity debate and then to add to unwarranted attention Beatty and Bonnie and Clyde co-star Faye Dunaway got caught in one of the biggest live Television mix-up’s in Oscar history – the mistaken announcement of Best Picture at the 2017 Oscar Awards when they incorrectly announced that Damien Chazelle’s La La Land had won Best Picture when in fact Barry Jenkins’s film Moonlight walked away with the coveted trophy much to the world’s astonishment. Personally I loved Rules Don’t Apply and have always been a fan of Warren Beatty’s work from his Robert Altman film McCabe and Mrs Miller opposite Julie Christie to his later work opposite his wife Annette Bening in Bugsy. 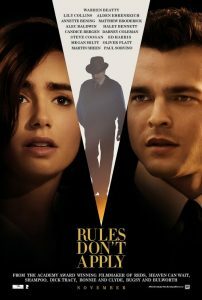 What really shines through in Rules Don’t Apply are the outstanding performances of the two young stars Lily Collins and Alden Ehrenreich who was so brilliant in the Coen brothers skit film Hail, Caesar! Beatty’s performance as Howard Hughes is superb and he captures the idiosyncratic obsessive compulsive nature of the truly eccentric billionaire who invested his inherited Texan oil drilling wealth in films and aviation, even becoming acquiring a majority share in Trans World Airlines TWA. However, Hughes developed a severely debilitating obsessive compulsive disorder (OCD) so aptly portrayed by both Beatty in Rules Don’t Apply and by Leonardo diCaprio in The Aviator. Howard Hughes’s OCD caused his lifestyle to become increasingly erratic and reclusive. Hughes’s continuous occupation with flying around the world, his bizarre womanizing and his globetrotting adventures are all perfectly captured in Rules Don’t Apply as the film’s action moves from California to Acapulco to Nicaragua and to London then back to Washington D. C.
With his immense wealth, Hughes hired dozens of would be starlets to come to L. A. and be in one of his films, all expenses paid including accommodation at lavish Hollywood Hills homes. Lily Collins plays Marla Mabry a pampered and conservative young girl who comes to Hollywood to be wooed by Hughes and star in one of his pictures. Her natural attraction for her dashing young chauffeur is clearly evident upon their first meeting. Alden Ehrenreich plays Frank Forbes, the young entrepreneurial chauffeur who immediately takes a fancy to the naive star-struck Marla. Although both of these young people are living in the shadow of an eccentric billionaire who is supporting their stay in Los Angeles. A bizarre love triangle develops between Marla, Frank and Howard Hughes, the latter being three times the age of the naïve young starlet who is seduced in a bungalow at the Beverley Hills Hilton after imbibing copious amounts of champagne. Rules Don’t Apply has a fabulous and glamorous old fashioned charm which is conveyed throughout the film ably assisted with smooth direction by Beatty who also casts some veteran supporting actors including Martin Sheen (Apocalypse Now), Candice Bergen (Gandhi) and an excellent performance by Matthew Broderick (The Producers). This Hollywood biopic which deconstructs the eccentric Howard Hughes gets a rating of 9 out of 10. Essentially, Rules Don’t Apply about an extraordinarily bizarre billionaire makes for fascinating viewing. Highly recommended especially if viewers have seen The Aviator.